The paint is peeling, and the "L" in Elihu B. Taft's name is askew on the school building named for the philanthropist who donated the land in the late 1920s. So it would seem the right time for the University of Vermont to begin its $2 million-plus renovation of the Taft School on South Williams. There's a problem, though. 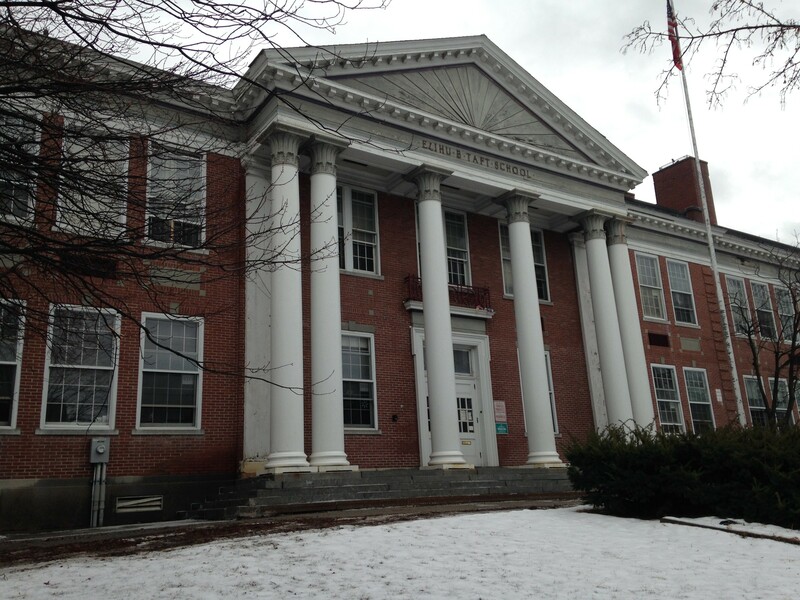 Two years after the Burlington School District and City Council agreed to convey the 1938 building to UVM under a $1.6 million, 80-year lease, the two public-school alternative programs now operating at Taft are stranded. UVM's lease begins July 1. But there is still no "permanent home" for the OnTop and Horizons programs, says Burlington School Board member David Kirk, Ward Seven. He's chair of the board's Infrastructure & Technology Committee, which is overseeing the relocation. The delay rankles some who opposed the lease to begin with, including Colchester Avenue resident Martha Lang. She finds it troubling that district officials, even with ample time, have failed to relocate students. "They still don't know where they are going to put them," Lang said. She objected to the lease, arguing that it went against the provision in Taft's will that directed the property be used for school children and, failing that, for indigent men. The courts took a different view and, after a lengthy legal battle, allowed the lease of the long-closed neighborhood school. School officials had been trying to sell it for years. A new location soon could be settled for at least one of the Taft programs, OnTop. It serves special-education students in grades five to 12. The district wants to put 27 OnTop students in leased space at the Chace Mill on Mill Street. Redstone Commercial Group, which owns the space through its Catamount Holding Co., is seeking a zoning change from "warehouse/office/lab" to "school." The Chace Mill is on the banks of the Winooski River, and safety has been part of the discussion. Redstone has offered to put up new guard rails and barrier fencing in response to concerns. A Burlington Development Review Board hearing is set for March 2. According to the application and supporting paperwork from Redstone, the 8,000-square-foot space would have five classrooms and accommodate 16 school employees along with the students. The Chace Mill space has already been used for education, apparently without the zoning change. State records show that Petonbowk Academy operated there during at least the 2014-2015 school year. The state-licensed independent school was authorized to enroll 15 students with autism and other disabilities. The Burlington School District is looking at other locations for Horizons, a program for students at risk of dropping out of high school. It typically enrolls 30 to 40 students. Horizons and OnTop program director Lynn Kennedy declined to comment on the relocation and referred a reporter to Superintendent of Schools Yaw Obeng. "We are considering several options and trying to be creative, while looking for the best accommodations for these students," he said via email. Obeng declined to elaborate further and said there will be an update at the next school board meeting on March 8. The UVM art department will use the Taft building, which will be renovated in two phases.